An early history of Kendo and Kenjutsu in America in different cities. I have often written on this blog about Japanese swordsmanship in the West. I believe that in order to understand the history of European and North American martial arts, one must but look at combat styles which at a certain point came in contact with the Western world, and which had an impact on people’s imagination. In this specific case, it also reveals differences in European martial arts of the time when they are compared with the new Japanese systems. Let us first examine the context. Japanese swordsmanship appeared in the United States of America around the late 1880’s. Martial arts in Japan at that time were coming out of their darkest period in recent history. Following the Boshin civil war, the Satsuma rebellion and the overall violence of 1860’s Japan, many of its people were happy to turn the page and forget about martial arts which had been used in these events. For many it was time for Japan to look to Europe for inspiration into proper “civilization”. The Japanese elite was also eager to appear “modern and civilized” to Western eyes. By the late 19th century, most of Western Europe had profoundly changed its sports to less violent and more codified formats. Football which had been at certain times an extremely violent sport could now be played safely and boxing was moving away from its bare-knuckle tradition to include the mandatory wearing of gloves. Those who could not be changed were repressed, such as savate which was for a time outlawed in France as empress Eugenie was quite shocked by its violence or stick fighting and faction fights in Ireland which were suppressed by authorities in favor of – relatively- tamer sports such as hurling. 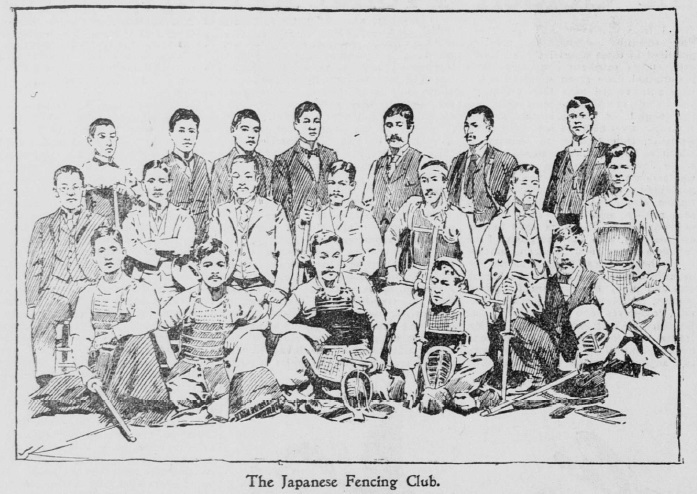 When examining American newspapers, we can discern two main periods when Japanese fencing received the most attention, mainly the 1890’s and early 1900’s. What was going on? During the 1880’s, there was a growing sentiment in Japan that Western culture was undermining the Japanese one and that cultural heritage should be safeguarded. One such heritage was bujutsu, but in order to fit into the new unified Japan, bujutsu had to also be homogenized. And so in 1895 the Dai Nippon Butoku Kai was founded, its mission was to standardize martial arts and promote them along with the virtues of bushido and warrior culture. It is in this environment that gekken, the ancestor of kendo, was created. Gekken was different from today’s kendo mainly because of its rules. Grappling was allowed and one could score points by tripping and even removing the helmet of a downed opponent. It is also useful to note that various schools continued to exist until the late 19th century and that there was hardly one single way to practice Japanese fencing. This is why the term gekken is used interchangeably with kenjutsu in certain articles. Outside of the purely cultural aspect, another reason was also behind this sudden interest in traditional fencing. The government was actively training potential soldiers to serve in time of conflicts. Indeed many instructors, some of them military veterans, were sent to the United States to open up gekken groups as well as shooting schools in case that expatriates would be called back to Japan to fight in its armies. For more information on this phenomenon, see the description of the Shimbunkan group in San Francisco in this same article. As you will see Japanese fencing was already practiced namely in New York much before the establishment of the Butokukai. Some Americans were introduced to gekken through trips in Japan and then invited instructors to come to America. Some also left on their own in the hopes of opening up schools of fence. The attention of the media was especially taken around the Sino-Japanese war from 1894 to 1895 and the Russo-Japanese war of 1904 and 1905. Before these conflicts, Japan was seen as a promising but rather weak military power. China and Russia had a longer experience in modern warfare and also had superior resources at their disposal. It then came as quite a shock when Japan came out victorious of these two conflicts. Something that was most peculiar in Western eyes was the feats accomplished by Japanese swordsmen who acquired quite a reputation, especially during the Russo-Japanese conflict. At that time, there seemed to have been two types of fencing in the Japanese military: a hybrid between the Franco-Prussian systems which had been recently taught to Japanese officers mixed in with Japanese techniques, and on the other side gekken which was more widely practiced outside of the military. In fact, many soldiers would have had years of experience in kenjutsu or gekken before even joining the military and so many of them chose to use the kyu-gunto, a type of short katana with a two-handed western grip or even a traditional katana. Training them in a totally different types of fencing was probably seen as counterproductive. It is a subject which has unfortunately received very little attention in Japan. Indeed, gekken was widely practiced not only by the public and the military but also the police forces, and while it was not part of the official public school curriculum until 1907, Japanese swordsmanship was still taught in some schools on a voluntary basis. 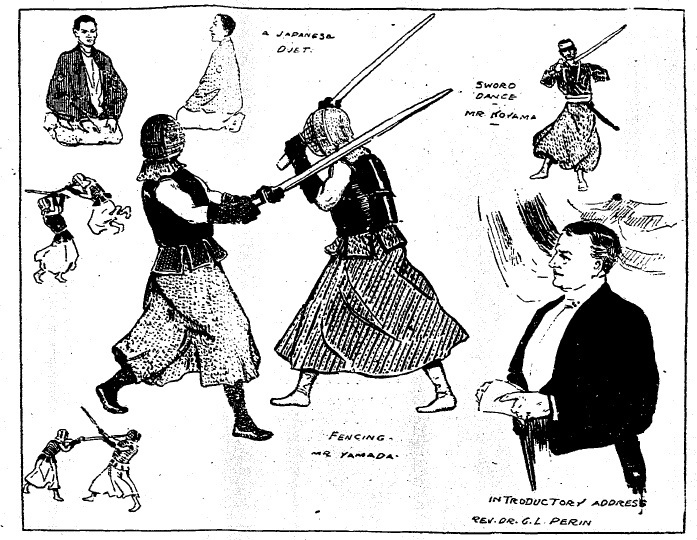 The ability of Japanese swordsmen is often noted in American Newspapers where reports of Japanese officers winning duels were noted and republished in many different newspapers. It seems the Japanese military – contrary to its opponents- still believed the sword to be a useful weapon of war, an idea that will continue up until the end of World War 2, a phenomenon that will help shape the image of Japanese swordsmen in popular culture. Here is a list of cities throughout America where gekken was practiced or at least demonstrated by the late 19th to the early 20th century. Out of all places, it seems that Cleveland received one of the first demonstrations of Japanese fencing in 1889. 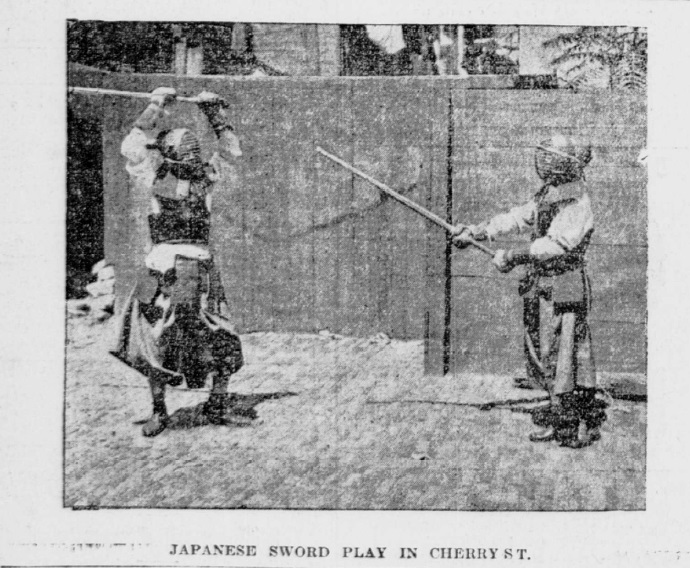 It isn’t clear what the nature of the demonstration was but a troupe of Japanese artists and acrobats was part of the Cleveland’s Minstrels’ show and demonstrated Japanese sword fencing along with other weapons (Plain Dealer, July 19th, 1889). This troupe did not deal in “blackface” as is commonly associated with minstrels groups but rather presented acts of Venetian Renaissance and Greek and Egyptian Antiquity. The troupe presented all around the US from Indiana to New York until around the year 1895. 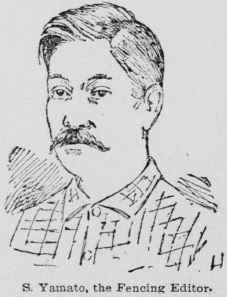 In May 1894, the Japanese man-of-war Takachiho stopped in Honolulu and invited reporters from the Honolulu Advertiser aboard their ship to witness a demonstration of fencing (Hawaiian Gazette, 29th May 1894). 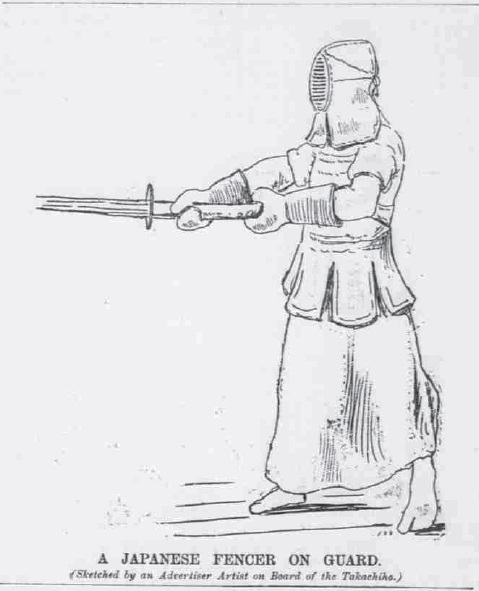 One of the fencers modeled for five minutes for the newspaper artist who drew the following portrait. Two years later, the gazette will report on a club on Maunakea street called “The Sunrise singlestick club” where gekken was being practiced without an instructor (The Hawaiian Gazette, January 28, 1896). Mr. Yamashita, a decorated army veteran, had been filling that position for the past six months as it seems but was recalled to Japan. The name of the club was explained by their location, just below a local Japanese newspaper called “The Sunrise”. Mr. Yajimai and Karikawa both held a demonstration for the reporters. The rules of this engagement were clear, only the head, wrist, sides and thrust to the throat were allowed. One visitor to the Sunrise Club even commented –rightly or not- in the same year that Fencing in Hawaii had “reached a higher degree of development than in France.” (The morning times, August 20, 1896). The cohabitation with the locals sometimes brought interesting debates. In 1904, a minister from the Central Union church had some Japanese parishioners who were practicing nightly with wooden swords. Mr. Scudder complained not of the fighting or the shouting but rather his problem was with the swords themselves. His argument was that “wooden swords are unchristian because Christ meant a steel sword” apparently from an interpretation of Matthew 10:34. Efforts were made by the community to find steel swords, namely with Camp McKinsley and the National Guard. Both declined as they were reportedly pro-Russian or neutral -referencing to the Russo-Japanese War- while finding a private source of “tin swords” appeared most complicated (The Independent, April 21st, 1904). Duels also took place such as in 1898 when two Japanese men fought for a woman with katana with over 15 witnesses attending. The two of them, plus the man who tried to separate the duo, ended in the hospital with critical injuries(The Pacific Commercial Advertiser, June 3, 1898). As can be expected, California was not far behind in experiencing Japanese martial arts. The Morning Call, probably one of the most prolific sources for martial arts articles in turn of the 20th century America, published on a group of Japanese men practicing a most extravagant sport of which the shouts greatly shocked their neighbors. On Sundays, the 60 members of the Shobou Association met around the 300th block of O’Farrell Street to practice gekken under the supervision of Mr. S. Yamato, editor of the San Francisco News, along with K. Harada and K. Sawaki both also instructors and editors to the journal. The practices were held right in front of a cavalry troop armory and the militiamen inside found the practice much impressive and violent. During their first practice, the soldiers actually ran out of their armory expecting to have to quell a riot, but much to their surprise found the men fighting with bamboo staves. According to the reporter, three consecutive hits were needed to win a bout while the crowd judged as to the validity of the strike. Another club was also very active in San Francisco as reported in the San Francisco Call of January 17th, 1897. The Shimbukan met on Post Street for gekken sessions under the supervision of Sino-Japanese War veteran professor Muto who allegedly defeated seven or eight opponents at hand to hand combat during the war. The club which counted about 200 members was run with military efficiency, notably with the help of a bugler to call students to attention during practice. According to their president Mr. Kurosawa a sister club, the Giyudan, was also founded to teach how to use firearms (bayonet fencing?). Kurosawa shed light on the sudden proliferation of gekken clubs around the US: according to him, the government sent instructors wherever there was a sizable group of Japanese people and had them train so that if a war was declared against Japan they could be called upon to serve in the army. San-Francisco at the time was a hub of criminal activity and violence and friendly matches were not the only thing happening as far as Japanese swordsmanship was concerned. Deadly duels were also fought including the one I reported in my previous article. New York City probably had one of the most successful scenes regarding Japanese fencing. The Fencer’s Club hosted a Ladies’ Night in West 28th Street on February 27th, 1893 (New York Herald, February 28th, 1893). Among the bouts presented was “Japanese sticks” with Mr. Charles Tatham and Mr. W. Scott O’Connor. In November of the same year, a gala to honour their new instructor Mr. Vauthier was given in their salle. Some of the guests included Mark Twain himself and along the demonstrations was presented a bout of gekken with Mr. Tatham and a certain Shilo Sacaze (Shiro Sakaze?). 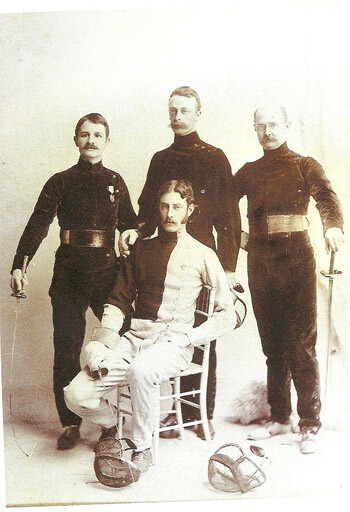 At the moment, it is not clear where the two met or how Tatham and O’Connor even came to be introduced to gekken, but for the following years Tatham would teach Japanese fencing in New York’s Fencer’s Club, doing demonstrations to various groups and in the meanwhile being decorated at the 1904 Olympics in fencing. Mr. Sacaze is not mentioned in the following sources. 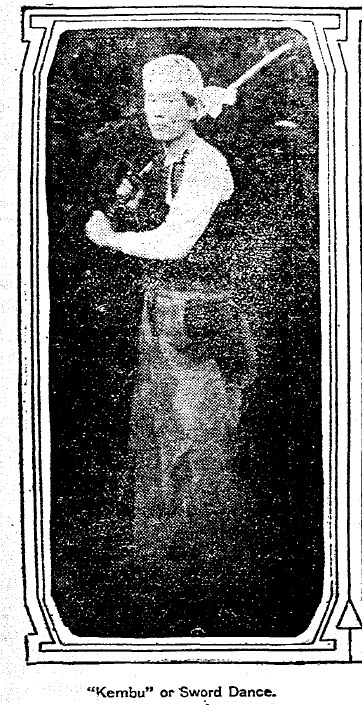 Tatham will continue giving demonstrations, sometimes as far as Philadelphia (Duluth News Tribune, February 3rd 1905). It is unclear at the moment how long these lessons were given. Update: Ben Miller found this mention of a husband – Taneyoshi Kawakami- and his wife Marumi both practicing a form of kenjutsu in armor in New York in 1897. Taneyoshi stayed in America for many years and even taught kenjutsu at St. John’s military academy and to General William Verbeck. In 1900, two Japanese sailors by the names of S. Akaeji and B. Makunaga arrived in New York City to teach gekken at a Japanese boarding house at 112 Cherry Street (New York Tribune, August 12th 1900). Gekken also caught the attention of rich tycoons visiting Japan or looking for a way to discipline their sons. One of them was Edward Henry Harriman, the president of the Union Pacific Railroad, who after two years in Japan decided to bring along with him a troupe of Japanese martial artists including the famous Mitsuyo Maeda (of Brazilian Jiu Jitsu fame), Tsunejiro Tomita and also some fencers including Mr. Isogai and his pupil Mr. Mizutani both from the Butokukai in Kyoto (Kansas City Star, December 29th 1905). Interestingly, Mr. Isogai was also teaching western fencing and naginata at the Butokukai, and it is possible that he taught and most assuredly demonstrated the later while staying in America. 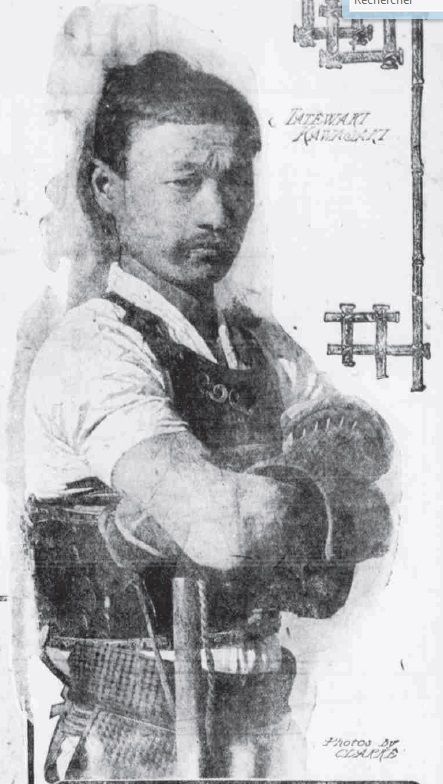 Another fencer joined them: Tatewaki Kawasaki, the gekken instructor at Tokyo College who was passing through the US on his way to England where he wished to open a Japanese fencing school with “the support of men of wealth and influence” (Omaha Daily Bee, February 26th 1906). Whether this ever became a reality is still unknown. For more information on Tatewaki read Ben Miller’s article. 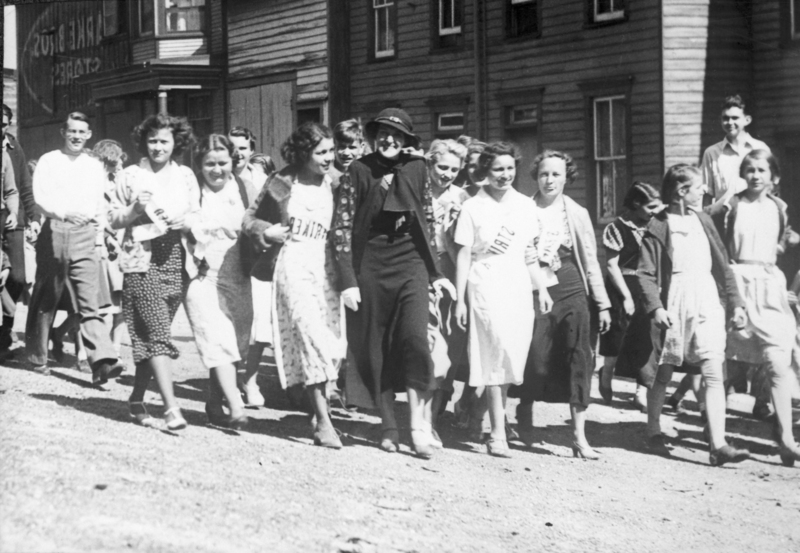 Gekken even attracted many women such as Cornelia Bryce, the American suffragette who practiced the sport which cultivated “strength and gracefulness”. 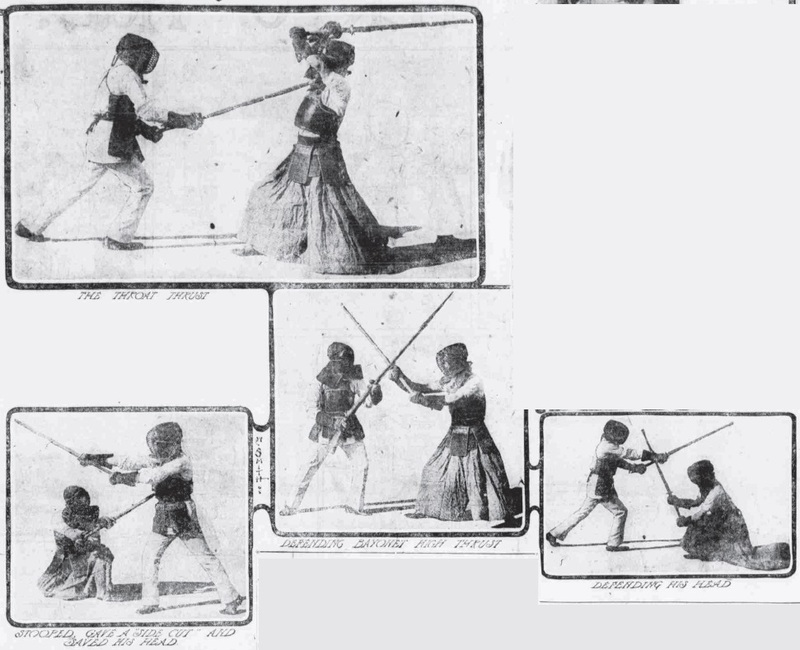 It seems that while jiu-jitsu was very popular with the boys, women preferred swordsmanship (Duluth News Tribune, February 3rd, 1905). Others found more practical applications for gekken, for example, a certain “Rosa Matto” who coming back from an evening practice in Brooklyn with a friend was assaulted by five men trying to rob them. 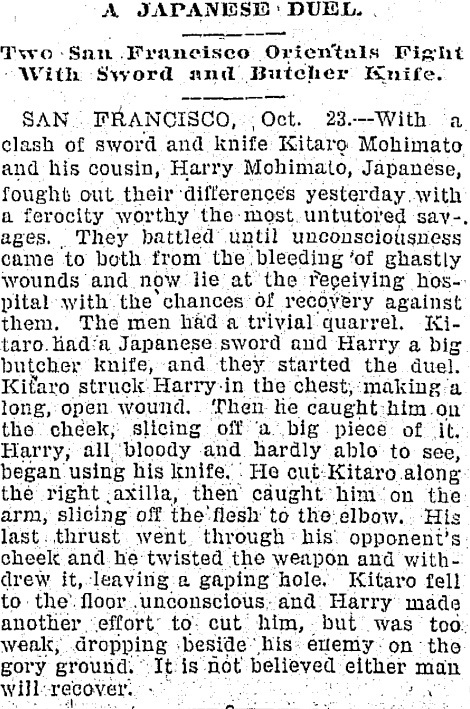 Matto had a live blade on him and used it to defend himself and send three of them to the hospital (Denver Post, May 4th, 1897). This small mining town in Arizona saw a traveling Japanese troupe pass through headed by Shosha Yokoyama, a famous Japanese wrestler of the time. Among his troupe were also gekken demonstrations as publicized on this ad (Bisbee Daily Review, October 19th, 1911). 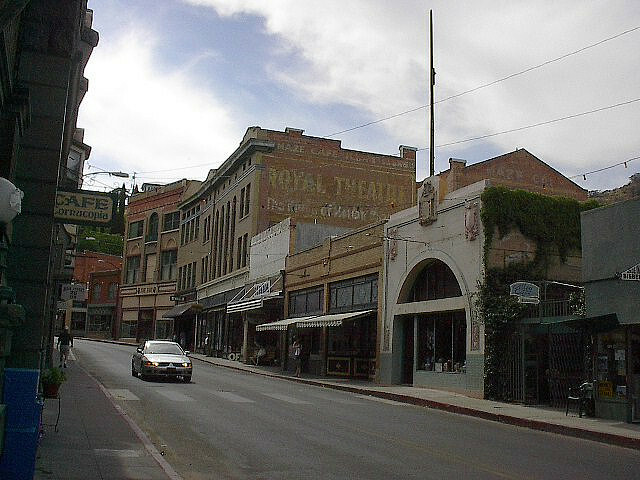 The Royal Theatre is still standing in Bisbee, although it is unclear what its current function is at the moment. 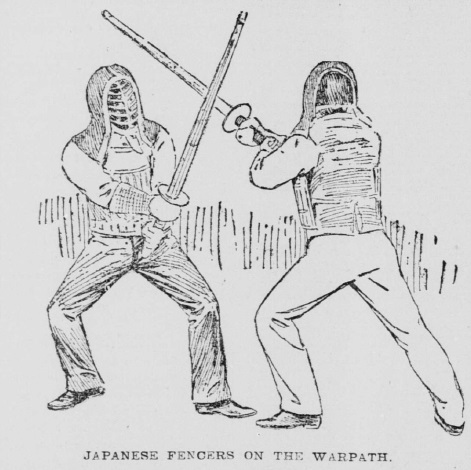 Interest in Japanese fencing in America seemed to mostly follow Japan’s military successes, and after Japanese victories in the Russo-Japanese War a renewal of interest towards Japanese martial arts sprung once more in America. To commemorate the victory of admiral Togo, many Japanese groups around the country organized festivities, many of the including gekken but also kenbu (Sunday Herald, June 4th, 1905). Due to the nature of this demonstration, it seems very plausible that a club existed in the area. Kenbu is a traditional form of dance in Japan which is normally done with a katana and a fan. It has roots in the Heian period but its modern version was mostly a product of the Meiji period starting in 1868 when former samurai were looking for a way to make a living through their fencing skills in the modern age. The following year another demonstration was organized, this time, to aid sufferers of the famine which was afflicting Japan. 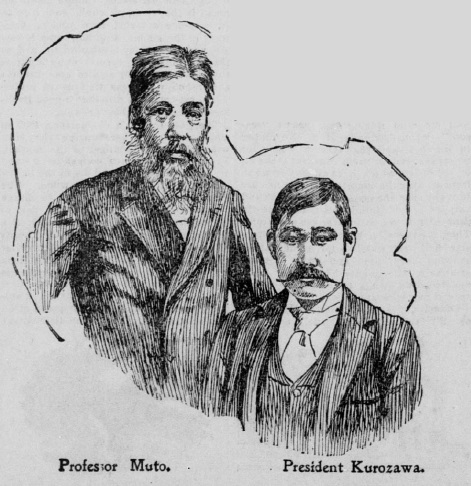 Kenbu was presented by Mr. Koyama and kenjutsu by Mr. Yamada (Boston Herald, March 28th, 1906). In 1912, a demonstration was organized at Seattle’s armory by the Seattle’s Press Club. Gekken and jiu-Jitsu were demonstrated along with English boxing. Mr. Kikwaku and Iwaoka fought in gekken (Seattle Daily Times, January 27th, 1912). Again in 1916, the Seattle Federation of Musical Clubs organized an evening of music, but also with a demonstration of jiu-jitsu and gekken by Messrs. Kasegawa and Manabe (Seattle Sunday Times, July 16th, 1916). Demonstrations were held around the Los Angeles area, namely, in Tropico (now part of Glendale) in 1905 to commemorate Togo’s victory (Los Angeles Herald, June 4th, 1905). In 1909, a demonstration of Japanese fencing was done by students of the Los Angeles High School Gymnasium. Considering that gekken was presented without any fanfare alongside gymnastics, wrestling pyramids and tumbling it is possible that it was practiced at the gymnasium along with those other disciplines (Los Angeles Herald, January 21st, 1909). A sword duel was also fought between two skillful women along a sporting place. Due to the timely intervention of a policeman none of them died, but they were both slashed all over the upper body (Philadelphia Inquirer, March 22nd, 1889). With the recommendation of Theodore Roosevelt, the Annapolis Naval Academy decided to teach jiu-jitsu (judo) and gekken to its recruits in 1904. While the jiu-jitsu experiment did not last very long (barely a year) it is unclear if the fencing was also canceled at the same time. 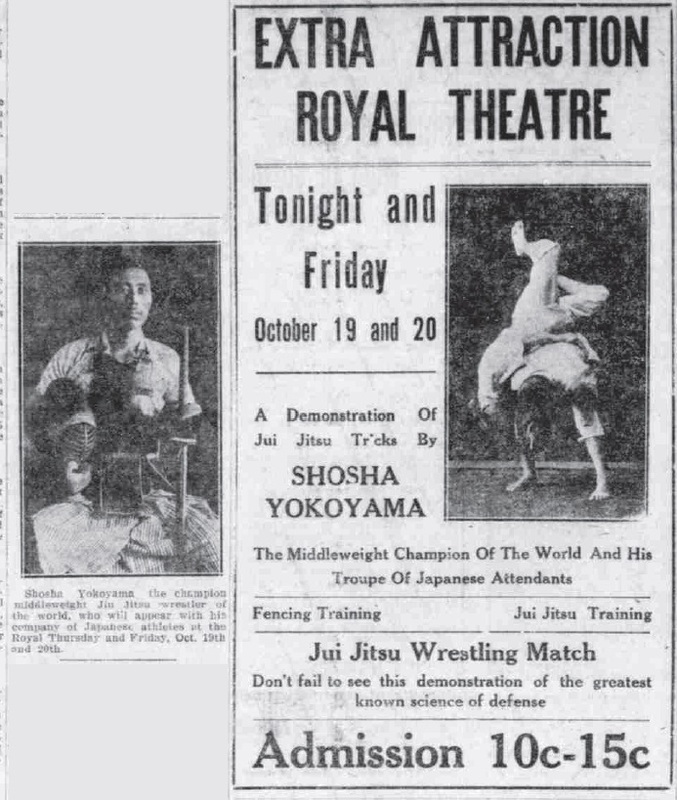 Exhibitions were also given by Japanese groups in Portland Oregon in 1905 (The Havre Herald, August 25th, 1905) and Salt Lake City in 1906 (Salt Lake Tribune, August 9th, 1906). There is a fascinating wealth of information to be found in newspapers of the era. While we often take for granted that Japanese martial arts were introduced to America after the Second World War, it appears that it was effectively quite active in the early 1900’s. Let’s hope that this article will lead to more research and discoveries! Acknowledgment: Thank you to George McCall for corrections and pointers.